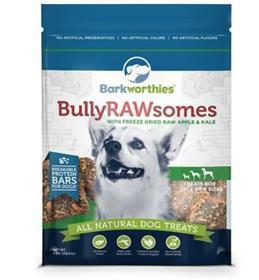 Barkworthies made protein bars for dogs possible with Barkworthies Bully Rawsomes with Freeze-Dried Raw Apple & Kale Dog Treats. Every bite is made with clean and simple ingredients including oats, bully flakes and freeze-dried raw apple and kale to lock in freshness. Nutritionally packed, each semi-moist protein bar is designed to refuel your dog to help him lead a healthier and happier life with a texture, taste and flavor he craves. Ingredients: Oats, Beef Pizzle, Glycerin, Cane Molasses, Gelatin, Apple, Kale, Citric Acid (Preservative), Mixed Tocopherols (Preservative).